After achieving a degree in fashion design with her final collection inspired by travels to the Icehotel in Swedish Lapland and numerous visits to Iceland, Kim joined Discover the World’s Nordic team before moving into our schools department for a period. She is now back in the Nordic fold and enjoys talking to people about the places which have provided the inspiration for her designs. Kim has travelled extensively through Sweden, Finland, Norway and Iceland and she also has a young son who often accompanies her on her Nordic adventures. One of their favourite places is West Iceland - a great location to get away from busy Reykjavik and to experience the remote, wild, and rugged country. My favourite place is the Icehotel! Having visited it for the first time as a family holiday and the other 2 times as a rep I have experienced both sides. And I loved working there as much as spending time on holiday! 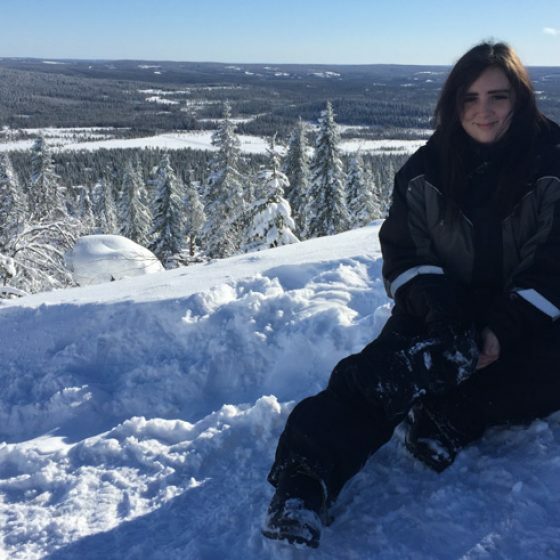 I enjoyed seeing the Art Suites, but most of all going snowmobiling out into the wilderness; seeing the Swedish Lapland countryside covered in snow was beautiful. Of course I should mention the northern lights as well, the best sightings I have seen are from right behind the hotel itself. I have been lucky enough to see them each time I have been there.